A relaxing weekend in the mountains was just what I needed to unwind and to celebrate the milestone of my 40th birthday!! It was also the perfect opportunity to break out a few of my new Fall pieces...like this sleeveless sweater. How many times have we heard people ask 'Are you a beach-person or a mountain-person'? Which would you pick? Did you know your answer is actually related to your personality type? Both are peaceful and incredibly beautiful with their amazing views. I recently read a study that suggests extroverts prefer the beach while introverts prefer the mountains. For extroverts, the beach provides more recreational activities, people watching, more people to hang out with and talk with and it's noisier. For introverts, the mountains offer more secluded places and isolation, less people and it's quieter. This past weekend for my 40th birthday (and my husband's 41st birthday-2 days apart) we spent 3 days up in the mountains. It was incredibly relaxing and so much cooler (like 15-20* cooler). We did some amazing hikes to 2 beautiful waterfalls, played in the creek bed, and just relaxed with the family. 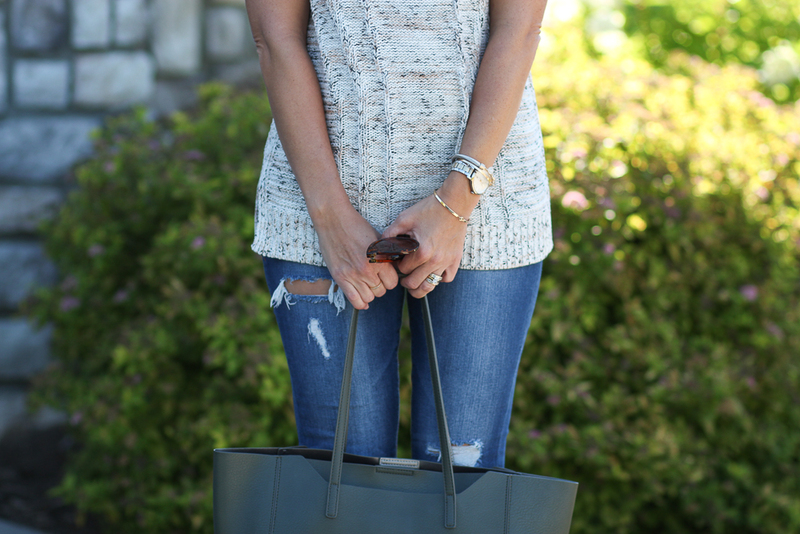 I wore this sleeveless sweater one afternoon and it was perfect for the early Fall weather. 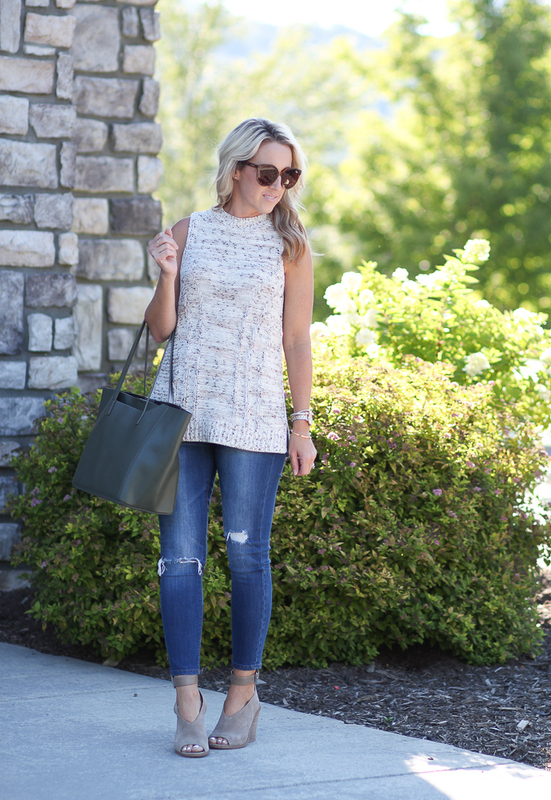 I love the marled knit and know it'll be adorable layered under a jean jacket or a suede jacket later this Fall. The sweater also comes in a pretty red/pink combo. Right now it's 40% off, so under $30!!! Also, these jeans are now my new favorites!! I love the fit and the distressing. They are currently part of a BOGO for $9.90 sale!! Do you feel this would be a good sweater for work, with skinny dress pants? I do think it could be work appropriate with dress pants. It has a classic neck line, the arm holes aren't too big (showing anything!) and it's not too bulky, so it'll be easy to layer something over it. Adding dressy sandals or heels would dress it up too. I love sleeveless sweaters, they are my favorite! I live on 10 acres in the foothills of the Sierras in Northern California, I'm definitely an introvert! I love the idea of 10 acres on the beach, need my space, lol! Living on 10 acres sounds amazing!!! Sometimes I wish we lived out in the middle of no where :) !!!! You should wear hats more often! You look adorable in them! Kate, thanks that's so sweet!!! I actually love hats, so I'm not sure why I don't wear them more. I loved the complete ensemble!! 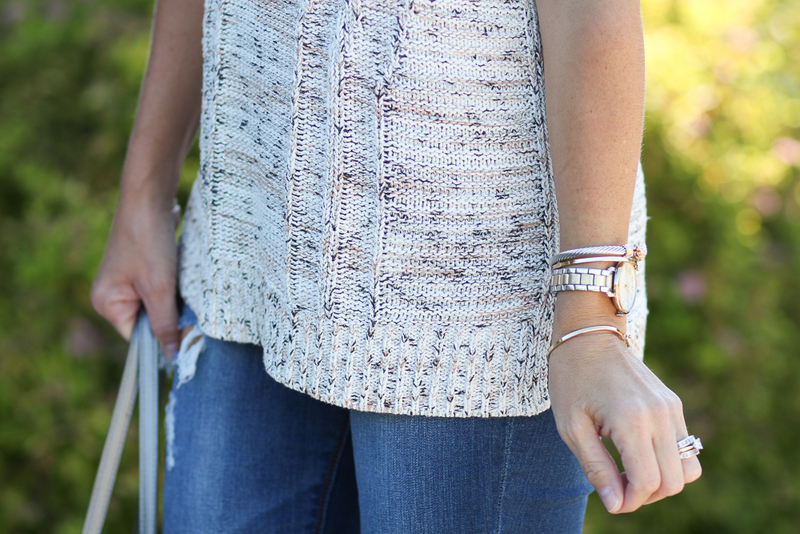 A sleeveless sweater is the perfect fall transition piece! This is such a cute look! I'm also loving your sandals!